Company Overview - Sichuan Hongya County Yaomazi Food Co., Ltd.
3YRSSichuan Hongya County Yaomazi Food Co., Ltd. Founded in 2002, Sichuan Hongya County Yaomazi Food Co., Ltd specializes in the production of Szechuan Pepper Oil. Yaomazi company is located in the hometown of green pepper --- Hongya county, Sichuan Province. With 30,000 acres of planting base and 2 production lines, we can produce 3,000 bottles of green pepper oil each hour. The company consists of a factory, a Green Pepper Culture Museum and a restaurant. When you visit our company, you can know the culture of green pepper, see the factory strength and taste Sichuan cuisine.Use the fresh-pressing equipment from Germany and high-end medicinal fractionated system, and combine with traditional crafts.Perfectly keep the goodness, aroma and numbness of green pepper, that the oil is more ecological,aromatic and nutritious.Decades on, With the development of 14 years, 'Yaomazi' has become the most popular 'green pepper oil' brand in China. 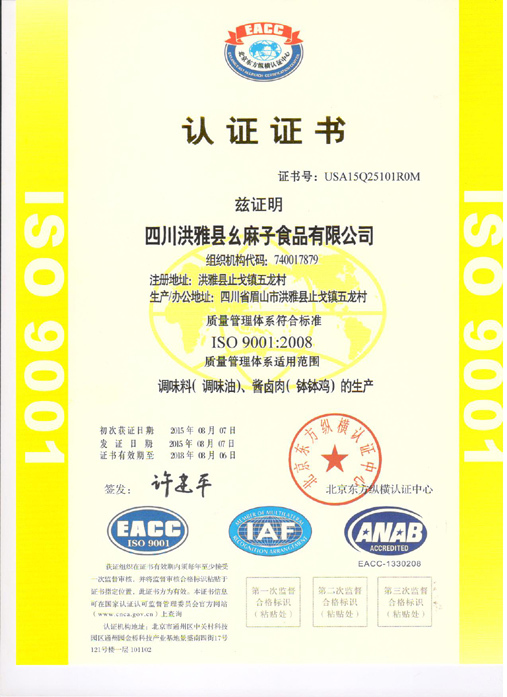 Yaomazi oil has been distributed to Japan, United States, Australia, etc. Yaomazi oil is increasing common in kitchen and on dinner tables, and blooming in China and the world.Green Pepper Oil is 'Yaomazi'. Looking for distributors worldwide.